Have you ever had a Cadbury's Double Decker? For the uninitiated it is a chocolate bar with a layer of nougat (is that pronounced 'nugget' or 'noogar'?) on the top and a layer of rice crispy balls on the bottom, smothered in chocolate. When I get just over half way through one I always experience, what I call, the 'Double Decker effect'. The experience starts when you look through the variety of chocolate bars in The Shop. You simply cannot decide which to buy. Obviously it's going to be either a Lion bar, Wispa, or Kit-kat Chunky but then you realise there are no Lion bars and you really wanted something a bit different. 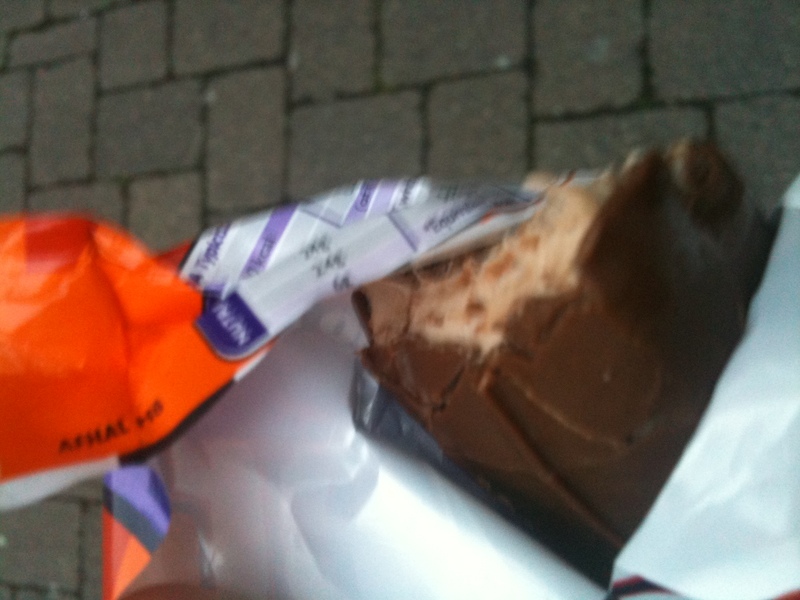 Its been a long time since you've had a Double Decker and the wrapper is a rakish combination of orange and purple. You a little bit too long and it has you. You can taste the sumptuous Cadbury's chocolate. You can feel the crunch of rich crispies. You want it, and looking at it sitting on the shelf in that seductive manner, you can tell that it wants you. You gently pull it from the roughly torn cardboard pack with all its sisters and look at it sitting in your grasp. It feels right. A bar that will not only satisfy you but make you hungry for more. You pay, and before you have left The Shop, you have subconciously torn the wrapper exposing an indecent amount of chocolate. Stepping into the street you tentatively touch the bar to your lips. You've been hurt before and you are nervous about that first bite. Close your eyes and take a modicum of chocolatey, nougatty goodness. It is delicious! You wonder why you have been eating any other sort of food. This is the finest of all foods. If you could taste colour, this would be a rainbow. You eat and everything is good. Troubles are forgotten and all is calm. A tear trickles down your cheek. This is not the 'Double Decker effect'. You are two thirds of the way through and it begins to rain. There is too much nougat. The sweetness overpowers you and you feel unpleasantly giddy. You masticate a gloopy mess which does not end. Each chew brings forth more of this unending saccharine. At the same time you realise that, next to previously chewed chewing gum, rice crispies are possibly the blandest substance in existence. You would expect the banality of the rice crispies and the potent sweetness of the nougat would cancel each other out. This is where Cadbury's have been really clever because they on intensify each other's strength, leading to an unending confectionary nightmare. By the end you rue the day you ever were seduced into looking at this hate-filled chocolate bar. This is the 'Double Decker effect'. I find this experience can be applied to all manner of things. Things where there is a sufficiently long gap between successive relapses. Like child birth, watching Last of the Summer Wine, drinking real ale on an empty stomach, skiing, listening to Portishead on wet February evening, visiting Coventry, and demonstrating to your wife that you know the name and director of every Star Trek: The Next Generation episode.